The three weeks I spent in Guachipilincito with the Brown/Shoulder to Shoulder brigade were a fantastic next step in my global health education. As one of the brigade leaders, during the first week I spent time seeing patients in clinic, collecting census data with the other group members and organizing the team, including clinic flow and nightly debriefing/team-building sessions. I also enjoyed the time I spent working with and teaching the medical students, talking through our clinical decisions as well as how to provide quality care in a lower-resource setting and within the cultural context of rural Honduras. During the second and third weeks of the trip, we continued to see patients in clinic and also focused on home visits, hiking out to see patients who could not travel to us. Another resident and I also worked in the CMI for several days, staffing emergencies, delivering babies and working closely with the Honduran doctors. This was a wonderful opportunity for a clinical educational exchange and for us to learn about the Honduran health system. We were also able to travel to the Rochester brigade site and see how they've incorporated public health projects into their brigade structure. 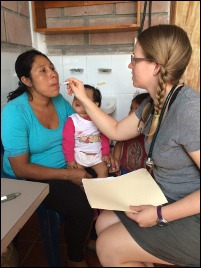 My goals for the trip were to explore how global health could fit into my career as a family physician, and I was happy to start finding those answers on this brigade. I hope to walk the beautiful mountains of Intibuca again in the future!